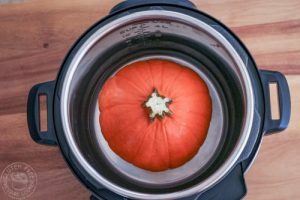 This is interesting, I normally steam the pumpkins I use but I think this method will not only be faster, but more flavorful. I will return here and tell you my results. Hi Sheena, man of my word, I am back with my review. You know more about pressure cooking than I do, I am a newbie to this. First, your recipe is 10 stars. 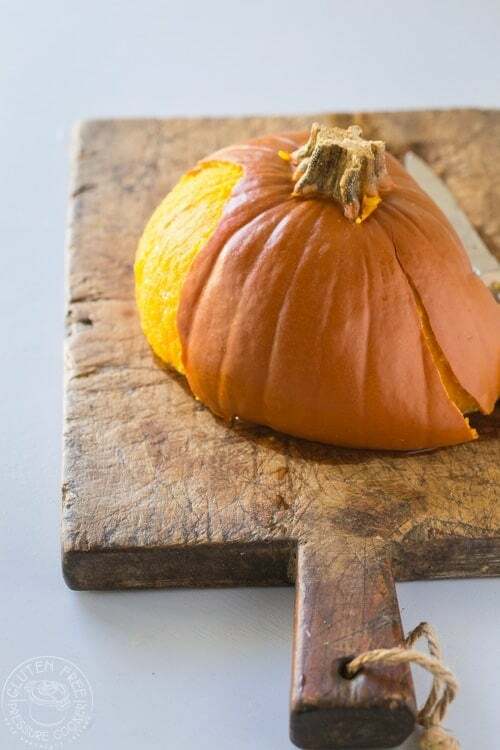 The technique is 100%, for a whole pumpkin. 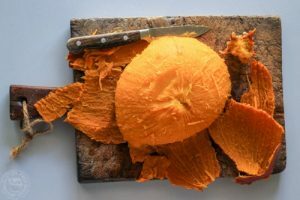 Skin on, uncut 2.5 lbs, where I live, much larger, not sugar pumpkins but what I call just winter squash. 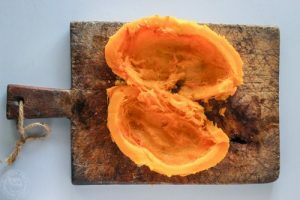 The are not pretty, Libby uses a hybrid Hubbard squash for their canned product (also not pretty). I Used 3 pieces that weighed 2 lbs (that was 1/3 of my pumpkin). 15 minutes produces a nice but overly tender pumpkin. So I made it again at 5 minutes on pressure (I have pieces with cut sides and that is the major factor). The 5 minute was perfect for mashed with butter as a side. The 15 minutes would be perfect for a pie. Overall, worthy of 10 stars, but I think a whole and cut pumpkin should get a mention and a mention on the slight time change. 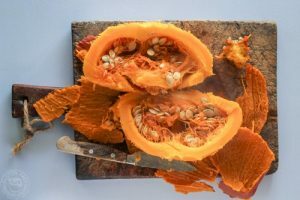 Thank you again for a great recipe for flavorful pumpkin and an energy saver. Just tried it after coming home from the Fireworks. Needed something bright, sweet and warm. I bought my pumpkin earlier but no one was there to cut it for me. So I thought to try this method. 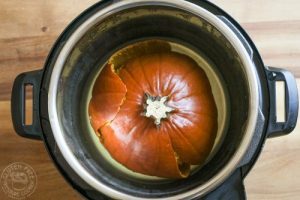 My pumpkin was nearly twice the size but still fit into the Pressure Cooker. I used 2.5-3 cups of water but a lot left there at the end so I guess less would have been enough too. In just 15 min. using the veggi program it was soft but not how I preferred so I used the program again. It came out just perfect. With a little cream, clove, cinammon and honey it was a satisfying meal. 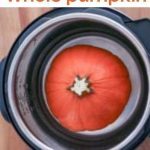 Thank you so much for this idea it makes life much easier and we can have pumpkin at any time without the hard work and mess!. Hi Naomi! Oh you’re making me homesick with talk of Bonfire night and fireworks! 🙂 I’m glad it worked well for you, it’s much easier than trying to peel it and quicker than the oven.